What is a Pashmina or a Cashmere shawl? Or for that matter what does the word 'shawl' mean? The word 'shawl' has different similar sounding terms in different languages e.g. in French, it is 'chale', in German, it is called 'schall' and in Italian, it is termed 'scialle' - all essentially meaning a square or a rectangular wrap, big enough to be draped around the shoulder, what is also commonly known as the 'shoulder-mantle'. When we say Pashmina or a Cashmere shawls, we are referring to the shawls spun out of the fine yarns made with fibers sourced from the discarded undercoats of Tibetan or Changthangi goats. They are also commonly known as 'changra' goats, which are found in the high altitude mountain ranges of these regions. The other known breeds, used to source pashmina/cashmere fibers are of Orenburg goats and Mongolian goats.Two main determinants of the quality in pashmina/cashmere are the fiber diameter and the staple length. For good quality, the manufacturers purchase material between 13 - 20 microns. To let you make a comparison, a human hair has a diameter of around 70 microns. When these fine fibers are spun into thread, a multitude of microscopic air-pockets are formed; it is these that give the material its extraordinary warmth and softness.It would be interesting to note that until well into the 19th century, when the ladies shawl became a high fashion item in the west, there had been similar products in use. 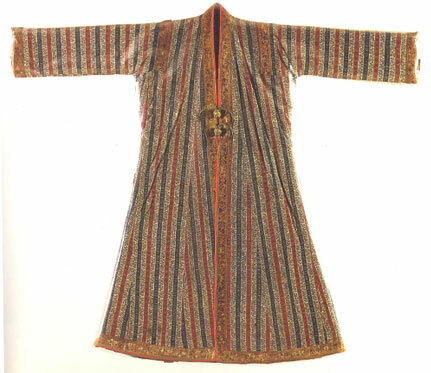 According to pashmina shawl historian Moorcroft, there existed 'do-shala'.....long shoulder-mantles woven in pairs. These were used by noblemen of the times. 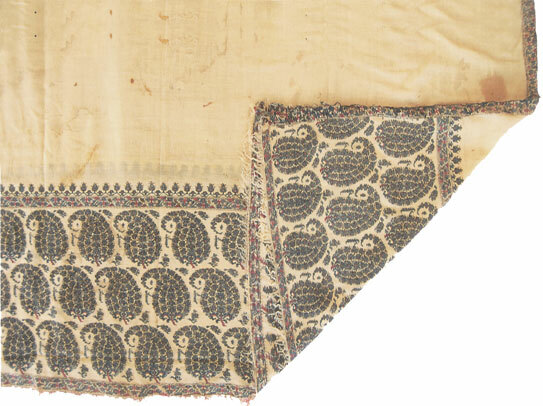 the do-shala shawl, often woven so cleverly that it is difficult to say that it has been joined/stitched together seam to seam! 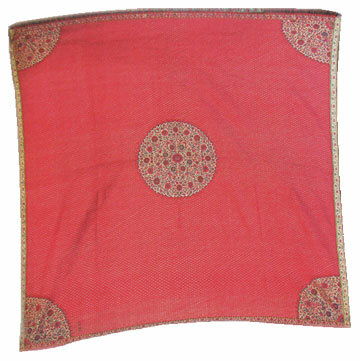 Then there were 'qasaba' or 'rumal', large squares for women's wear. this particular rumal shows the moon motifs prevalent in those times! Also, there were 'shamla' or 'cummerbunds', girdles for the waist, worn by Asiatics. What a beautiful cummerbund it is...! 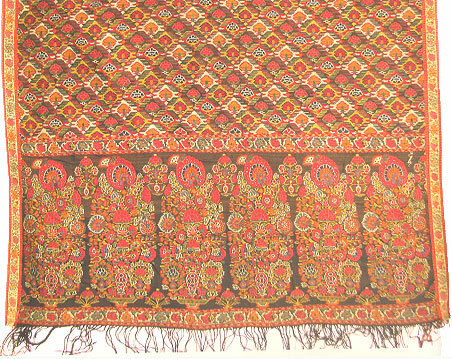 The modern term 'jamawar' popularly used in shawls today, originated from a particular type of all over design, which were tailored into 'jama', or various over-garments, worn by men e.g. - 'choga', 'angarkha', 'atamsukh'. 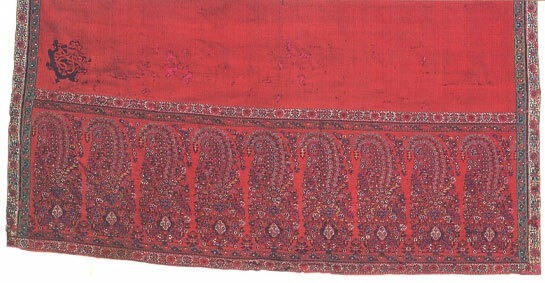 the jama or choga using jamawar work, on which today's jamawar shawls are based. So the art of weaving a pashmina/cashmere shawl or a more popular stole or scarf, dates back to many centuries. In old times, it had various avatars e.g. 'rumal', 'jama', 'doshala','cummerbund'. But the art of weaving a shawl/stole is still preserved in its original form when it is hand spun and hand woven. Though now-a-days, it is woven on power looms also. The art of adornment in the form of hand embroidery is still as painstakingly done, as in yore. The special embroidery technique of 'kani' is also being recognised today for its beauty and precision......though its design /talim is being computerised now...the actual work is still being done by hand.